Wales is perhaps one of the most underrated countries for walkers. In spite of its rugged, bleak reputation, Wales offers a huge diversity of landscapes, and no less than three National Parks where people can roam. From the stark beauty of Snowdonia to the Brecon Beacons, or the coasts of North Wales and the Gower, there’s something for walkers of all levels. Whether you’re looking for day walks or walking holidays, Wales has plenty to offer. The Brecon Beacons is one of three Welsh National Parks where hikers can enjoy everything from a good stroll lasting a little over two hours to a complete eight day holiday on the Brecons Way Walk, which extends for a little over 100 miles. The area includes Pen-y-fan, the tallest mountain in the south of Wales, which is excellent for ridge walkers (close by is Corn Du to extend the ridge walking). Those just wanting to stretch their legs can take the path around Sugar Loaf or the Nat Llech Waterfall Trail. Both take in the region of two hours and offer real beauty (the latter is classed as a site of Special Scientific Interest). Snowdonia isn’t only home to Snowdon, which rises 3,500 feet from the ground, but three other peaks over 3,000 feet high. It’s also a huge National Park, running all the way from Cardigan Bay to Conwy Bay. Snowdon itself is the prime destination for hikers here, of course, and it can be approached from any of six routes, although the easiest, Llanberis, will take up to six hours, while Snowdon Ranger Path, a much sharper climb will take five hours – although you’ll only cover seven miles, as opposed to the 10 of Llanberis. Beddgelert and Dogellau offer something much flatter and less challenging, with truly lush scenery, but much of Snowdon is better suited to experienced walkers who can enjoy a climb, as in the Ogwen area. Although there are walking holidays in Snowdon, the emphasis is more on day walks that allow hikers to explore small pieces of Wales’ most rugged area. That said, there is the Edge of Wales path, 142 miles long around the North Wales coastlines, or – nearby – the walk around Anglesey, just across the Menai Strait, which is 125 miles, and takes you all around what was once the sacred isle of the Druids. The Gower Peninsula in South Wales also offers plenty in the way of coastal walks, and even has its own walking festival, with many guided walks and events to cater for all tastes and abilities. It’s an area with plenty of beaches, making it ideal for combining walking and some gentle sunbathing in the summer. The trail from Three Cliffs Bay to Oxwich Bay is very popular, and Oxwich Bay, named as one of Britain’s best beaches, makes a perfect end to a walk. At 18 miles long, the Gower Peninsula isn’t the stuff of long distance walks, but the natural distractions of the coast would keep all walkers stopping and staring anyway. It’s much more suited to day (or shorter) outings. The Pembrokeshire Coast Path, running for 186 miles, offers one of the best walking holidays in Wales, going around much of the south coast and up the west coast to Cardigan Bay, taking in a total of 58 beaches and 14 harbours along the way. 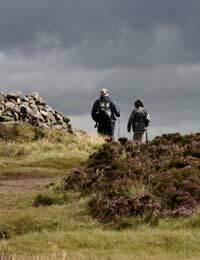 It’s one of the 15 National Trails in Britain, and definitely one that’s suitable for people of almost all walking abilities, as there are ample places to stop en route, as well as a bus service that covers the entire distance for those who need a break. Add to that 130 short circular walks that run off the Coast Path, most taking no more than a couple of hours, and there’s something to please most walkers. Named for Welsh hero Owain Glyndwr, this is another National Trail, running for 135 miles from the border with England, starting off in Knighton (where Offa’s Dyke Path also runs) and going all the way to Welshpool, back near the border, after crossing about half the country to reach Machynlleth on the Dovey Estuary. The whole walk quite aptly commemorates Glyndwr and some of the battles he fought. It’s laid out in stages so that people can comfortably cross 16 to 20 miles in a day and find somewhere to rest. Much of the land is fairly flat, making it easy going, with plenty of B&Bs and guest houses for when you want to spend the night. It’s a walk that serves as a reminder that Wales can indeed be a very green and pleasant land.